This scenario shows NASA's free-flying robot in action. The space agency has teamed up with TopCoder in a contest to name the new space robot. NEW YORK — NASA needs your help to name a new space robot, and you could win some cash doing it. NASA officials are asking space fans around the world to help name, and design a mission patch for, a new free-flying robot expected to launch to the International Space Station in 2017. The first-place winner of the challenge will receive $1,000. Officials with the space agency put out the call to any interested space fans during a packed session here at New York Comic Con on Saturday (Oct. 11). "We have this new free-flying robot that we're building," Jason Crusan, director of NASA's Advanced Exploration Systems division, told a full house at Comic Con. "We don't know what to call it. 'Free-flying robot' sounds kind of boring and not all that exciting, so we're asking you to actually name the robot for us." Second, third and fourth place also come with cash prizes. Second place will win $500, with third and fourth prize taking home $250 each. NASA has teamed up with Topcoder to organize the contest. If an artist's depiction of the new space automaton is any indication, the new robot may look like something out of "Star Wars." 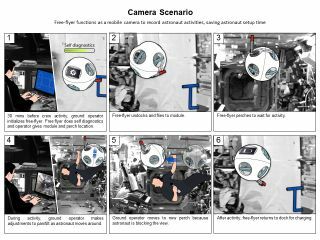 In the artist's concept, the robot could appear as a small, ball-shaped droid that will use fans to move itself around the interior of the International Space Station. It is expected to be able to fly itself, or be operated by remote control. The new free-flying bot would join a group of other free-fliers already on the station. NASA's SPHERES robots (the name is short for Synchronized Position Hold, Engage, Reorient, Experimental Satellites) are already used on the orbiting outpost. The program has been running for seven years, and is designed to help scientists test robotics hardware and software in microgravity. The SPHERES robots and the new robot should be able to move around autonomously, but humans living and working on the orbiting outpost can also control the satellites. "As the push for manned and automated exploration of the solar system expands, NASA and the NASA Ames Research Center are creating controlled and autonomous robotic devices capable of supplementing flight crew," officials wrote in a description of the challenge on the Topcoder website. "These 'free-flying robots' will eventually extend the research and exploration capabilities of astronauts, as they are capable of working during off-hours and (eventually) in extreme environments." To participate in the NASA challenge to name the new robot, space fans need to register with Topcoder. Participants will reach a checkpoint where they will receive feedback on their initial designs on Oct. 22, and the challenge ends on Oct. 27. Officials will announce the winners of the competition on Nov. 2. To participate in the challenge and learn more about it, go to http://www.topcoder.com/challenge-details/30046039/?type=design&noncache=true.